Which 7-Inch Tablet Is Best For Who? Compared to its competitor 7-inch tablets — the Google Nexus 7, Amazon Kindle Fire HD and Barnes & Noble Nook HD — the iPad mini is about $130 more expensive, but also feels and looks like it’s more expensive. The iPad mini’s screen is 0.9 inches wider, but the resolution isn’t as good as those other 7-inch tablets. The iPad mini also runs every app that the regular iPad does. Thanks to a consistent screen ratio, apps easily scale down, though with the screen more scrunched, iPad mini users have to be a bit more precise with their finger movements. What does that all add up to? 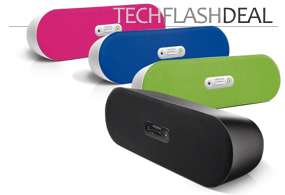 If you a regular reader of the Spot Cool Stuff tech blog you know that we often don’t like to recommend a product without giving some information about who we would recommend it for. Here’s our advice on which 7-inch tablet is best for who. To make some of your own comparisons, check out our tech spec comparison chart, below. 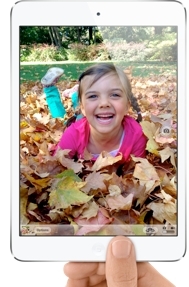 The Apple iPad mini is the superlative choice by a considerable margin. 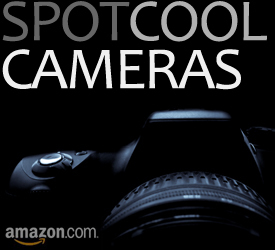 Its camera is far superior to the competition. Plus it shoots 1080p HD video. Plus it is powerful enough to run video editing software. Plus it comes with the most on-board memory (64GB) for storing all those photos and videos. The Apple iPad Mini isn’t only easily the best tablet of the four in this comparison to take traveling — it is tops among all tablets. (If we haven’t already updated our review of the best tablet computers for travel we will soon.) The mini’s small size, light weight, thin form factor, long battery life, international cell connectivity and huge selection of apps make it an ideal road companion. Our only complaint (and it is a modest one) is that the iPad mini’s slightly wider screen makes it hard for smaller people to operate with one hand. The iPad mini is not for you if you are seeking optimum value. As a piece of hardware, the Nook HD probably offers the most for the money, especially since its storage capacity can be easily and cheaply upgraded with the purchase of a microSD card. That said, we could make the case for either the Google Nexus 7 or Kindle Fire HD being the best value too. The performance of the Nexus feels the zippiest of the lot (something you wouldn’t guess simply looking at the tech spec comparison chart). If you are a member of Amazon Prime — and we think everyone should be — then the Kindle lets you stream movies for free~cheap. See our post about Amazon Prime for more. The Barnes & Noble Nook HD is for you. If you are in the market for a device that’s only an eBook reader, you’d be better off with a Kindle Paperwhite. But with the Nook HD you are getting the easiest-to-read, highest resolution screen of the four 7-inch tablets in this comparison. That makes it the most pleasant to read books on, especially when you take into account the well-designed user interface and native integration with the excellent BN eBook store. Plus the Nook is a pretty good tablet in its own right — watching movies, checking email and surfing the web look great on the Nook’s high resolution screen too! If you are already entrenched in Apple’s technological ecosystem via your iPhone (and maybe a Mac computer too) it is hard forgo an Apple iPad Mini in favor of one of the other three tablets in this review. All your iPhone apps will work on your iPad mini and you’ll easily sync up with iCloud, Mac Mail and all the other Apple services. One note of caution: The iPad mini uses Apple’s new Lightening Connector, the same as the iPhone 5 but different from the 30-pin connector used by all previous iPhones. To use your old accessories you might need to purchase an adapter. If you already own an iPad, then you’d find an iPad mini superfluous — there’s literally nothing a mini can do that a full-sized iPad can’t (except fit into a smaller space). Consider getting an Amazon Kindle Fire HD, pairing it with an Amazon Prime, and using your new 7-inch tablet to read eBooks, stream free Amazon videos and run Android apps that’s aren’t available for the iPad.
. . . or for people who fit into more than one of the above categories, you’ll have to look at your budget, weigh pros and cons, and make the best choice you can. Study the tech specs, below, to help with that. We would say, though, and if you’ve read all the above and aren’t at least leaning towards an Apple iPad Mini then you should probably could save yourself $100+ and purchase something else. If you aren’t going to join Amazon Prime then, all else being equal, you probably don’t want to get an Amazon Kindle Fire HD either. That leaves the Google Nexus 7 and the Nook HD. 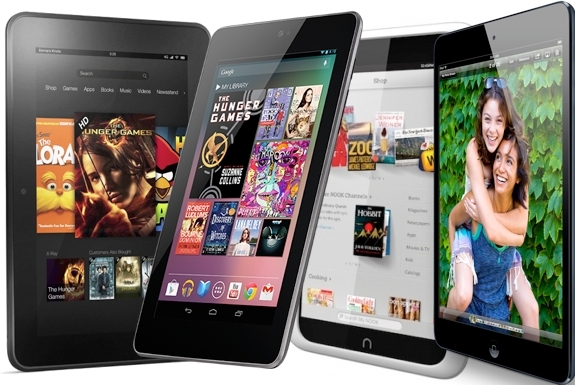 Of those two, we think the Nook is the superior product. Regardless of which you choose, it is nice to know that you have four great options. Should You Upgrade To An Apple iPhone 5?